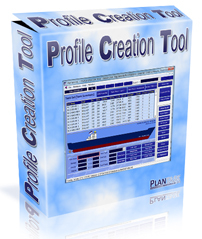 The Profile Creation Tool allows you to build a database of Level 2 and 3 profiles (Stability and Strength) for use in the PLANMASTER system. It has a number of intuitive screens to assist in the entering of the data and includes tools to ensure the accuracy of the user input. It is the perfect accompaniment to the Bay Plan Profile program bundled with the PLANMASTER system. Contact us for more information on this useful addition to the PLANMASTER suite.